The GOLD PRICE today rose $10.80 (0.88%) to $1,241.10. SILVER flew up 1.83% or 27¢ to $15.003. Y’all don’t shoot the messenger, but the charts aren’t optimistic. 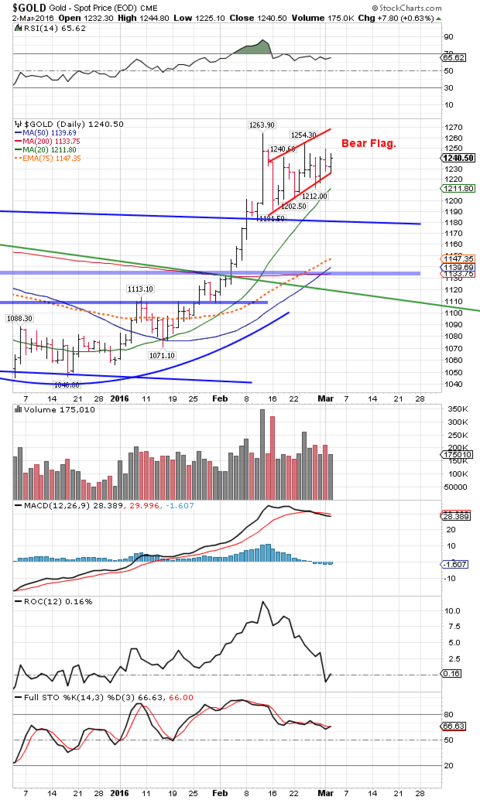 The GOLD PRICE has formed a bear flag, and thereateneth still to tumble to $1,180. Silver moved bravely but only touched its 200 day moving average ($15.03). Can still slide to $14.40. What turns them decisively heavenward? A gold price close above $1,264 and silver over $16.00. That would send gold MUCH higher and it would drag silver along with it. Bear in mind I am only looking for a small correction. I still maintain that silver and gold prices both bottomed and completed the post-2011 correction in December. GOLD/SILVER RATIO remains at the very top of the 20 year range, closing today at 82.723. Y’all still have time to swap gold for silver, but you’d better jump. 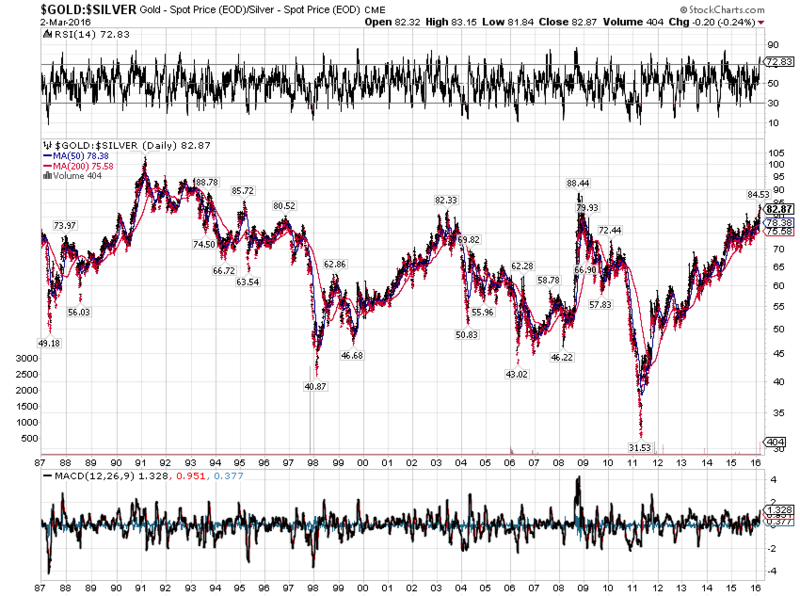 Here’s a 30-year chart of the gold/silver ratio, so y’all can get a good idea of what I mean by the range. This is an End of Day chart so it exaggerates my numbers, which are Comex closes, but the picture is similar. Note the top of the range is about 84.5, the lower end about 43. Shows a 2011 spike down to 29.08, but actually that was 32. 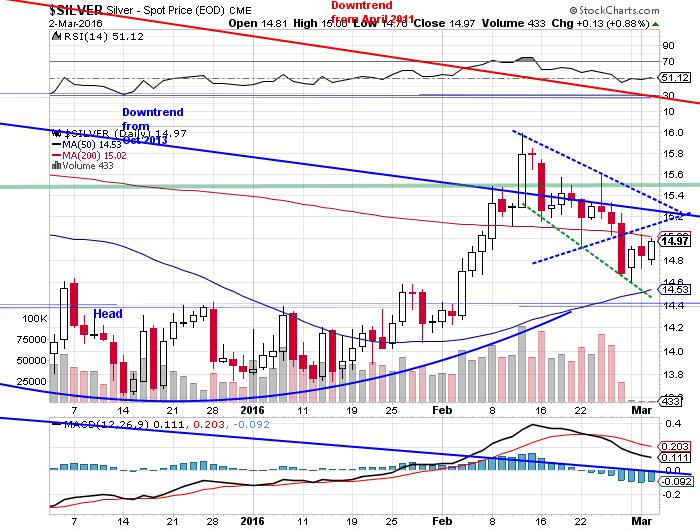 Also shows target for next silver to gold swap about 32. Mark also how overbought the ratio is, as measured by the RSI indicator. Our gold/silver swapping strategy swaps OUT of gold and into silver near the range’s top, and back OUT of silver and into gold at the range’s bottom. Friends, it just don’t work like this for long. EVERYBODY cannot win, and last few days gold and silver have been flexing their muscles, stocks a-rising, and the pestiferous US dollar levitating. ‘Sgonna change. Yesterday, Dow rise 348.58 (2.11%) higher. Today it was underwater most of the day, until 3:30, then closed up 34.24 (0.2%). Mmmm. S&P 500 added 46.12 (2.4%) yesterday and another 8.10 (0.4%) today to 1,986.45. Stocks have entered that territory where the going becomes miry and swampy, the resistance more determined. Bottom could fall out tomorrow or two weeks from now, but fall out it will. Background for all this is a correction of stocks’ brutal fall from 2016’s opening and silver and gold’s rally from same. Be patient, let it unroll. ‘Twill soon resume major trend. US dollar index waxes awfully wilty and melty when it nears its 50 DMA. Been over it for three days, but today backed plumb back, 17 basis points or 0.18%, to end at 98.19, almost dead on the 50 DMA. If it intends to rally further, through the May 2015 high at 100.04, it’s sure keeping its cards close to its breast. No insistent strength as you’d expect from a bull, just fits and starts and faintin’ spells.